Post chemotherapy Wilms Tumour (PCWT) is a diagnostic conundrum both for the clinician and the pathologist, in view of its morphological similarity with ectopic immature renal tissue (EIRT). However, due to their varying prognoses and different lines of management, it is important to distinguish between the two. Here, we discuss clinical presentation and pathology of a case of PCWT, arising in a horse shoe deformity of the kidney in a 5 year old girl. The discussion focuses on the pathogenesis of Extra Renal Wilms Tumour (ERWT) as well as its distinguishing morphological features and chemotherapy induced changes in Wilms tumour. Wilms tumor (WT) is a common malignancy of childhood. The diagnosis in a classic case of Wilms tumour is usually straightforward. It is also known to arise in extra renal sites, commonly in the retroperitoneal or inguinoscrotal region. In these circumstances, there can be a considerable diagnostic dilemma. Here, we present a case of extra renal Wilms tumour (ERWT) occurring in a child presenting with a retroperitoneal mass, who had been given neoadjuvant chemotherapy earlier for a diagnosis of round cell tumour, reported on fine needle aspiration cytology (FNAC). The excised tumour showed features of a Wilms tumour - post chemotherapy. We highlight the difficulties faced in distinguishing ERWT from morphologically similar differentials, including ectopic immature renal tissue (EIRT) associated with or without a teratoma, yolk sac tumour or sometimes, even a meningomyelocele. A 5 year old girl presented to our institute with a mass in the sacral promontory since eight months. She had a history of an abdominal mass diagnosed on FNAC as a small round cell tumour (? rhabdomyosarcoma) at a different centre. For this, she underwent chemotherapy over 28 weeks, which included Vincristine, Actinomycin D and Cyclophosphamide. During surgery in our institute, there was difficulty in separating the mass from the left common iliac vessel. It was also noted to be adherent to the left ureter and to the central bar of a suspected horseshoe kidney. Microscopy revealed dense fibroconnective tissue and adipose tissue, within which were scattered tubular structures lined by a uniform, single layer of cuboidal epithelial cells, some containing eosinophilic secretions. Occasional tubules lined by multilayered epithelium with mitosis and pleomorphism were observed. A few immature glomeruli were identified. However, blastemal elements were lacking. Large cystic spaces lined by flattened epithelium along with haemorrhage and collection of foamy macrophages were present. Immunostaining was done for OCT4, AFP, SALL4, WT-1 and cytokeratin. All immunostains except for WT-1 and cytokeratin were negative. WT-1 staining showed positivity in the stroma and focal positivity in the epithelial elements. Tubules showed cytokeratin positivity [Figure 1]a,[Figure 1]b,[Figure 1]c,[Figure 1]d. The features were those of a Wilms tumour, post chemotherapy. The possibilities of teratoma, meningomyelocele or a yolk sac tumour were ruled out in view of the absence of skin, dermal appendages, glial tissue and meningeal elements and negative immunohistochemical staining. A careful review of her CT scan confirmed the presence of a horseshoe deformity. A large, hypodense mass was noted arising from the fused part of the horseshoe, extending up to the left kidney [Figure 2]a. Contrast enhanced images showed a mass with heterogenous enhancement, mostly on the left side of the isthmus of the horseshoe, extending up to the left iliac fossa [Figure 2]b and [Figure 2]c. The child was then started on chemotherapy using Adriamycin D, Vincristine and Doxorubucin for 24 weeks. On follow up over two years, she has been doing well with no recurrence noted on abdominal ultrasounds till date. Extra renal WT accounts for 0.5-1% of all cases of WT, with a strong female preponderance. It is most commonly reported in the retroperitoneum or the inguinoscrotal region and rarely, in the endocervix, mediastinum, ovary, uterus, lumbosacral and sacrococcygeal region (associated with horseshoe kidney or spinal dysraphism). Beckwith and Palmer initially proposed criteria for establishing the diagnosis of primary ERWTs, suggesting that there should be no associated renal tumour, teratologic elements or anaplastic features for diagnosing ERWT and that it should be characterized by epithelial cell predominance showing primitive tubules and glomeruloid configuration along with primitive blastemal and spindle cell stroma. ERWT has been hypothesised to originate from ectopic metanephric blastema, primitive mesodermal tissue of mesonephric duct remnants as well as from malignant transformation of cells with persistent embryonal potential. Others suggest a teratomatous origin, due to its association with nephrogenic rests. The embryology of EIRT is not clearly understood. Improper closure of neural tube was once considered a mechanical barrier to the migration of the developing metanephric blastema, as they are concurrent developmental events. However, it failed to explain the presence of EIRT in the absence of spinal dysraphism. A newer theory suggests the role of genes namely, vangl 2, nerve growth factor receptor (NGFR), glial cell line derived neurotrophic factor (GDNF) and neutron (NTN) in its pathogenesis. Histology of EIRT shows aggregates of blastemal components, tubules, well formed glomeruli with a variable amount of admixed fibrous stroma. This makes it challenging to differentiate from foci of nephrognenic rests, considered to be a source of WT. The features favouring a diagnosis of EIRT are the presence of microscopic, scattered nests and islets without a surrounding fibrous pseudocapsule along with presence of elements from other germ lines. There is usually a limited amount of metanephric blastema. Frank atypia, atypical mitoses and marked pleomorphism are reliable characteristics of WT. It has been also proposed that areas resembling WT in teratomas should be reported as nephroblastoma-like, if extending for half to a whole microscopic field seen with a 4x objective, and as an immature component when smaller. AFP positivity may be suggestive of EIRT with teratoma or other germ cell tumours. WT1 is helpful in distinguishing the two entities. [Table 1] highlights the clinico-pathological differences between EIRT and ERWT. The diagnostic conundrum faced by the pathologist is compounded when the patient has undergone chemotherapy. The blastemal component of WT readily responds to chemotherapy, while mature epithelial and stromal components are much less sensitive to chemotherapy. This may explain the histological picture in our patient, which showed fibrosed necrotic areas with absence of any blastemal tissue. Epithelial elements may show cytodifferentiation, with extensive glomerular and tubular maturation, thereby resembling EIRT. About 10-15% of Wilms tumors may even differentiate into mature mesenchymal tissue types, such as skeletal muscles, which can be misdiagnosed as a primary renal rhabdomyosarcoma. The term 'Chemotherapy induced changes' is now gaining prognostic and therapeutic significance with increasing use of the SIOP regime, implying the need for increased awareness of these changes. In our case, disappearance of the blastemal component led to a difficulty in differentiating the diagnosis from a teratoma with ectopic immature renal tissue (EIRT). Extensive sampling is recommended to look for elements from other germ cell layers. In cases with extensive glomerular differentiation, the differential diagnosis of yolk sac tumour has to be considered because immature glomeruli can resemble Schiller-Duval bodies. An estimation of tumour markers like serum alpha fetoprotein or staining for AFP, OCT4, glypican or SALL4 can be useful in such cases., In this patient, Serum AFP levels were checked during the preoperative period and was 2.2 ng/ml, which was within normal limits. Immunostains were done for OCT4, AFP, SALL4 and WT-1. All immunostains, except for WT1, were negative in the tumour sections. An increased risk of developing WT is documented in patients with a horse shoe deformity of the kidney. Most cases are diagnosed retrospectively, as evidenced by case reports, where an accurate diagnosis is made only after surgical intervention. The evaluation of CT findings and clinical details are essential for the interpretation of a retroperitoneal mass on FNAC examination. However, a definitive diagnosis of ERWT is usually made post operatively by histopathology. The differences between ERWT and EIRT are not restricted to academic discussion alone. It is also important to distinguish the two in view of the poorer prognosis and management of ERWT, which includes adjuvant therapy and routine follow up. ERWT is a rare entity which needs to be distinguished from teratoma with or without EIRT and yolk sac tumour, especially in patients who receive prior chemotherapy. This is essential in view of the better prognosis of the latter condition and the need for adjuvant therapy in the former. Sastri J, Dedhia R, Laskar S, Shet T, Kurkure P, Muckaden M, et al. Extra-renal Wilms' tumour – Is it different? Pediatr Nephrol 2006;21:591-6. Thakkar NC, Sarin YK. Extra-renal wilms' tumor: A rare diagnosis. APSP J Case Rep 2015;6:17. Beckwith JB, Palmer NF. 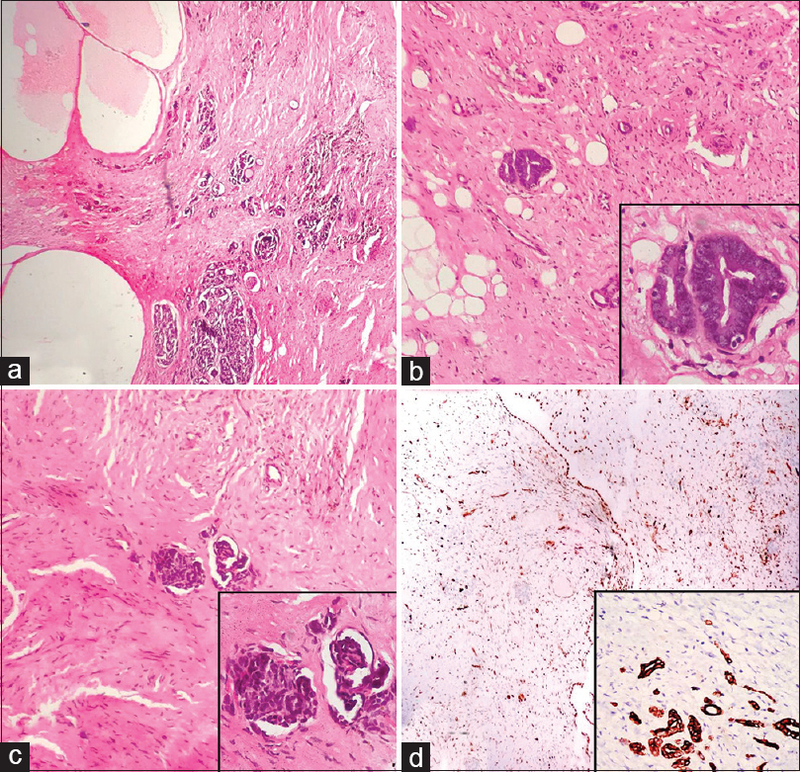 Histopathology and prognosis of Wilms tumors: Results from the first national Wilms' tumor study. Cancer 1978;41:1937-48. DasGupta S, Ghosh R, Das RN, Chatterjee U. Sacrococcygeal teratoma with ectopic immature renal tissue. Indian J Pathol Microbiol 2015;58:124-5. Abrahams JM, Pawel BR, Duhaime AC, Sutton LN, Schut L. Extrarenal nephroblastic proliferation in spinal dysraphism. A report of 4 cases. Pediatr Neurosurg 1999;31:40-4. Valdiserri RO, Yunis EJ. Sacrococcygeal teratomas: A review of 68 cases. Cancer 1981;48:217-21. Parvin S, Sengupta M, Mishra PK, Chatterjee U, Banerjee S, Chaudhuri MK, et al. Gastric teratoma: A series of 7 cases. J Pediatr Surg 2016;51:1072-7. Steelman CK, Bannister LL, Palmer M, Chang TS, Elawabdeh N, Shehata BM. Nephrogenic rest within a lipomyelomeningocele in a patient with unilateral renal agenesis. Fetal Pediatr Pathol 2012;31:260-4. Al-Adnani M, Walker J, Cohen M. Sacrococcygeal teratoma with extensive nephrogenic differentiation: A rare finding not to be misdiagnosed as yolk sac tumour. Histopathology 2009;54:764-5. Parvin S, Ghosh R, Das RN, Saha K, Roy P, Datta C, et al. Primary renal rhabdomyosarcoma: An unusual bone metastasizing tumor of kidney. Fetal Pediatr Pathol 2016;35:251-9. Baskaran D. Extrarenal teratoid Wilms' tumor in association with horseshoe kidney. Indian J Surg 2013;75:128-32.